Statistics show it no longer makes sense to use in-house resources to follow up on past-due patient accounts. If you aren’t collecting before or during the visit, your likelihood of collecting the balance at all decreases significantly. Relying on sending statements every month, making periodic phone calls and hoping balances will be paid is a strategy that's no longer effective. Now that your patients are one of your top payers, you need to be proactive and rethink your collection process to ensure success. It’s much more effective to automate these efforts so you can use your valuable in-house resources on more productive tasks. Is your physician practice experiencing the 10-10-10 Rule? Just 10 percent of calls made actually connect with a person. Of those connected calls, only 10 percent reach the intended recipient. And of those calls that are answered by the right person, just 10 percent are able or willing to pay. Today, patients are the third-leading payer in the country behind Medicare and Medicaid. If practices continue to chase after collections with manual phone calls, patient debt will continue to pile up. Practices are businesses in the end, and now they're dealing with consumers, not just patients. In order to survive, let alone thrive, they must confront the new realities of healthcare. At MedEvolve, rather than having our staff make phone calls to patients, we use an auto-dialing solution that connects real-time with a staff member whenever a patient answers the phone. This method ensures time is spent actually speaking with patients about their bills rather than making phone calls to no avail. Using analytics to determine patient communications preferences, and timing, our rules-based engine triggers outbound emails, text messages, letters and calls to maximize the likelihood of connecting with patients. By leveraging automation in your collections process, you can to take control, improve patient satisfaction, reduce bad debt and practically eliminate the need for costly collection services. After making 400,000 phone calls using our auto-dialing solution, we still only connected to 10% of the patients, but we were able to connect to more because of the volume of phone calls. On average, the calls resulted in about $43 collected. We collected 17% of the total aging accounts receivables. Imagine trying to accomplish that without automation! 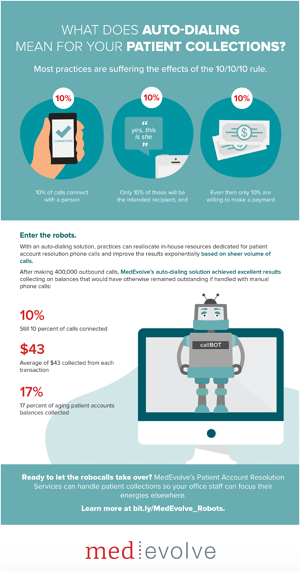 MedEvolve knows what it takes to have success with patient collections. We work with hundreds of practices dealing with the same disruptions and changes across the nation, and we’ve applied our experience and industry knowledge to help them transfer in-house responsibilities to a system with proven results. If you are looking to improve patient collections at your practice, lets discuss how we can help! Call 1.800.964.5129 to schedule a demonstration or request a free RCM Assessment. Or complete our form to have someone contact you.